Update as of March 1, 2018: Since we ran our original analysis, additional data on fulfillment center openings has become available. We re-ran our analysis and found that the updated data confirm our previous results. See the Appendix for more information. Since its founding in 1994, Amazon’s network of fulfillment centers has grown to nearly 100 across the country. In 2017, publicly available data identified 95 Amazon fulfillment centers in 25 states. 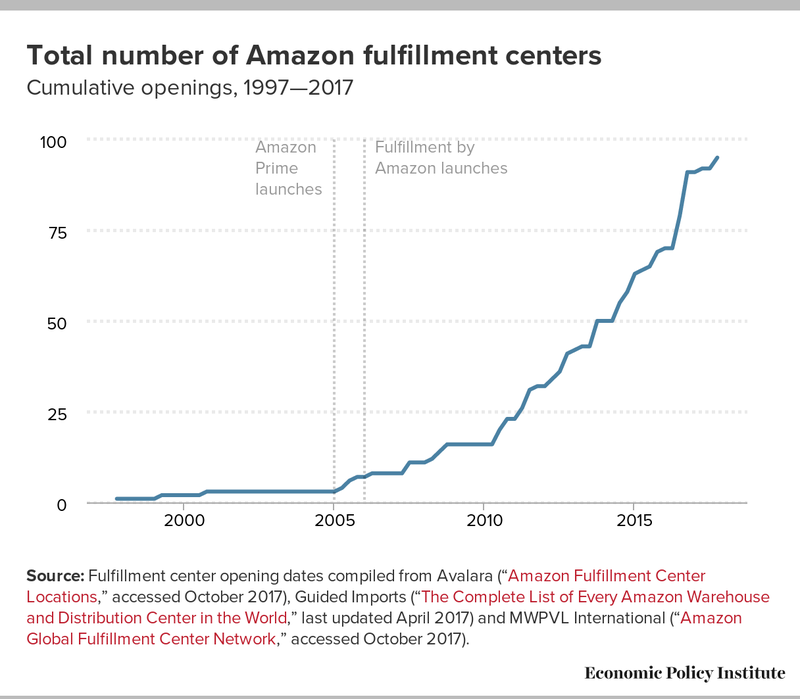 Current estimates suggest that fulfillment centers occupy over three-fourths of the total square footage of Amazon’s entire U.S. distribution infrastructure. (See Appendix Table 3 and methodology for data sources). 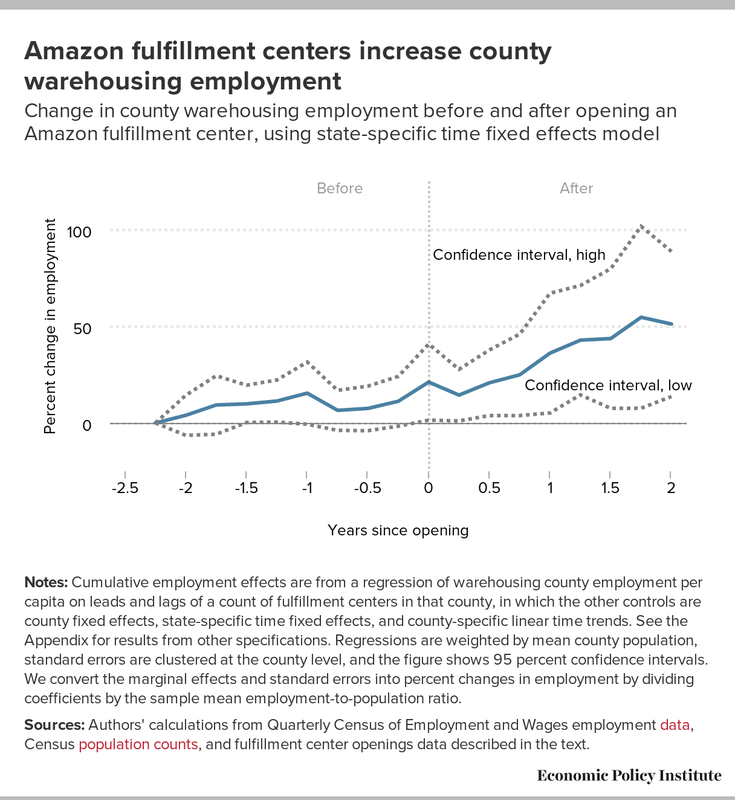 Notes: Cumulative employment effects are from a regression of warehousing county employment per capita on leads and lags of a count of fulfillment centers in that county, in which the other controls are county fixed effects, state-specific time fixed effects, and county-specific linear time trends. See the Appendix for results from other specifications. Regressions are weighted by mean county population, standard errors are clustered at the county level, and the figure shows 95 percent confidence intervals. We convert the marginal effects and standard errors into percent changes in employment by dividing coefficients by the sample mean employment-to-population ratio. Notes: Cumulative employment effects are from a regression of county private-sector employment per capita on leads and lags of a count of fulfillment centers in that county, in which the other controls are county fixed effects, state-specific time fixed effects, and county-specific linear time trends. See the Appendix for results from other specifications. Regressions are weighted by mean county population, standard errors are clustered at the county level, and the figure shows 95 percent confidence intervals. We convert the marginal effects and standard errors into percent changes in employment by dividing coefficients by the sample mean employment-to-population ratio. Update as of March 1, 2018: Since we ran our original analysis, additional data on fulfillment center openings has become available. 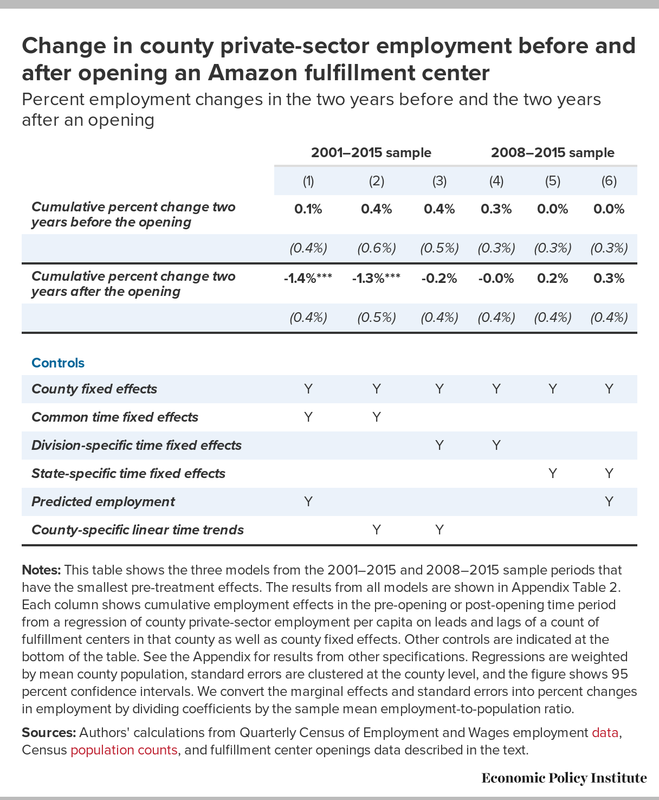 Using the same analysis with updated data confirms our previous findings that fulfillment center openings in a county do not significantly add to overall private sector employment in that area. Details of our analysis of the updated data are described below. As of February 28, 2018, the list of MWPVL fulfillment center openings contains some openings that we did not include in our original estimates.21 The openings data we use in the original study indicate 69, 91, and 95 fulfillment center openings by the end of 2015, 2016, and 2017, respectively. After we incorporate all additional fulfillment center openings reported in the updated MWPVL data that contained quarterly or monthly dates of opening, the number of fulfillment center openings increases to 75, 100, and 120 openings by 2015, 2016, and 2017, respectively. 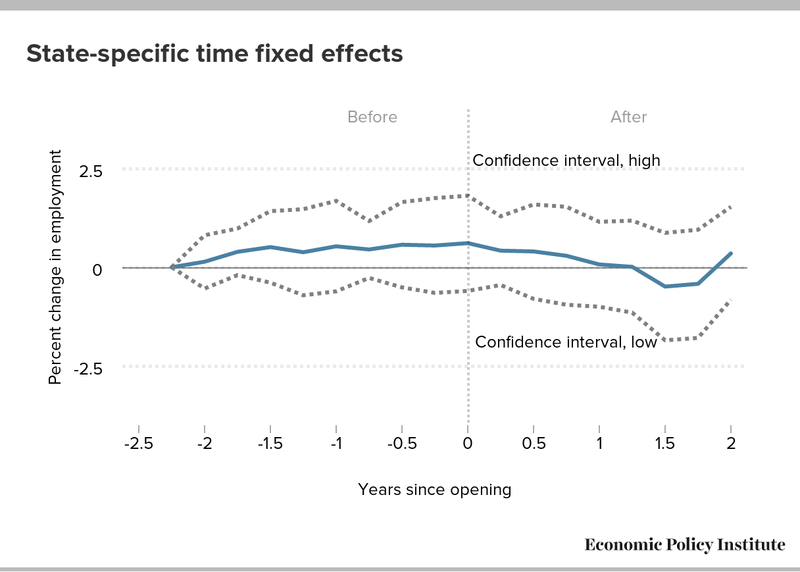 These additional openings do not meaningfully affect our results. 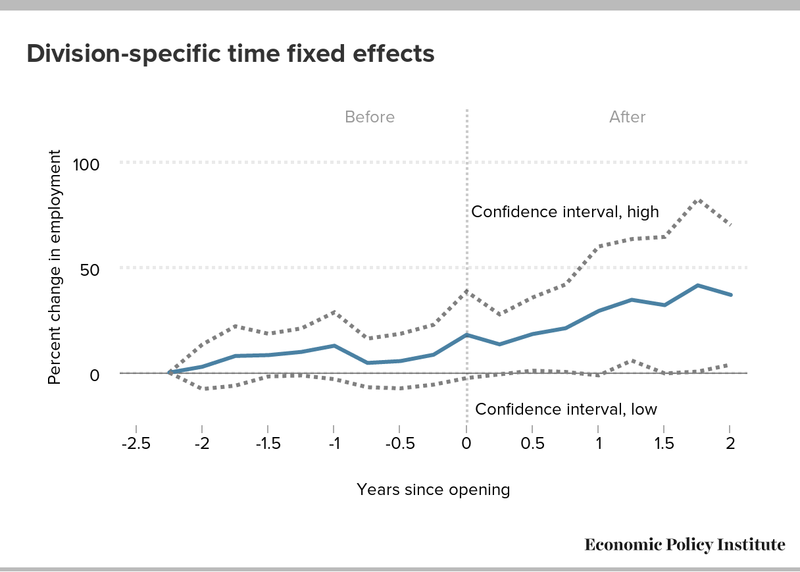 Using nine models over two sample periods, for a total of 18 specifications, we previously found that a fulfillment center opening affected total private-sector employment by somewhere between -1.5 percent and +0.3 percent (see Appendix Table 2). 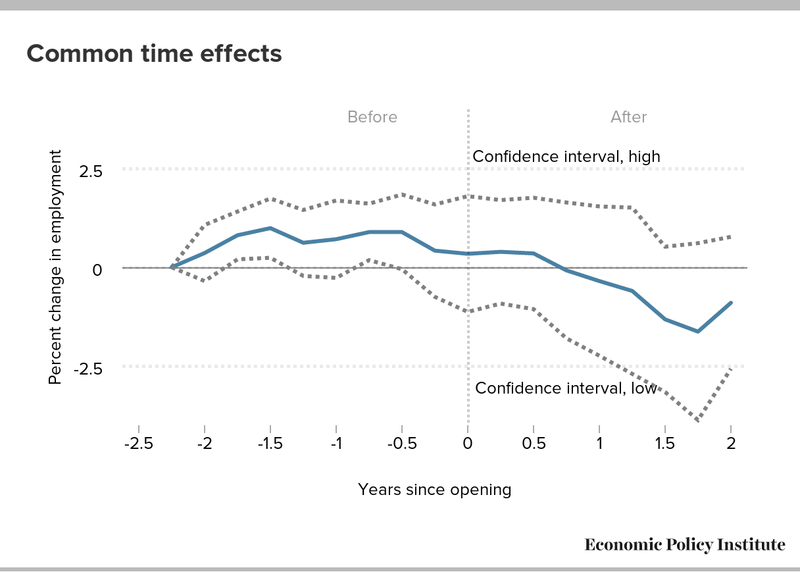 Running the same analysis but with the new, updated data, we find that the effect on private-sector employment ranges between -1.4 percent and +0.2 percent. In both cases, most results are not statistically distinguishable from zero. 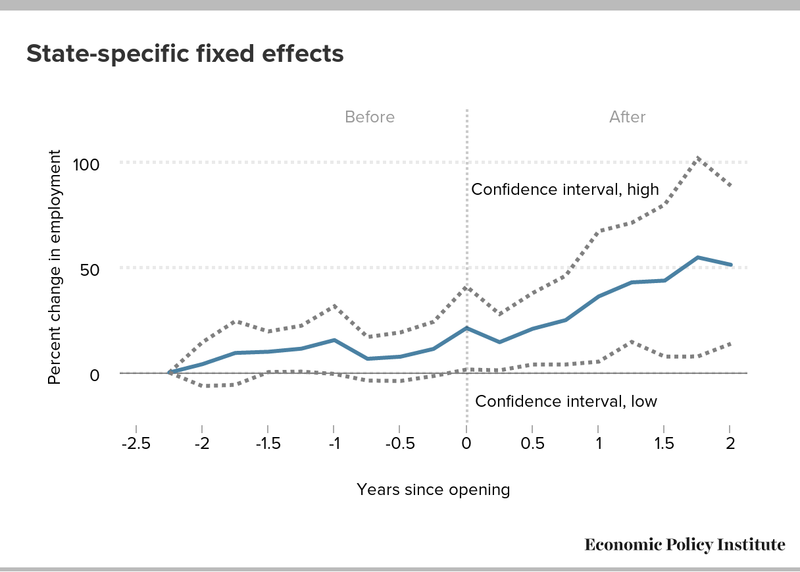 In no case do we find positive overall employment effects that are statistically significant. The current paper and the appendix tables and figures continue to report the estimates that we originally published. Notes: Cumulative employment effects are from a regression of county warehousing employment per capita on leads and lags of a count of fulfillment centers in that county as well as county fixed effects and county-specific linear time trends. 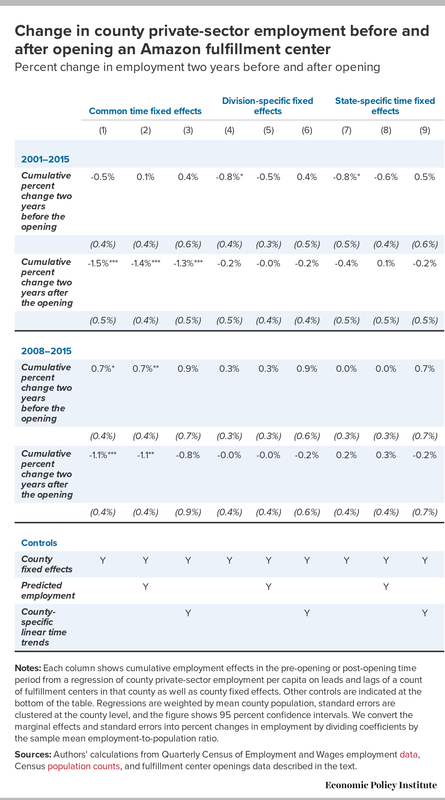 The top, middle, and bottom panels, respectively, show specifications with common, Census division–specific, and state-specific time fixed effects. See the Appendix tables for results from other specifications. Regressions are weighted by mean county population, standard errors are clustered at the county level, and the figure shows 95 percent confidence intervals. We convert the marginal effects and standard errors into percent changes in employment by dividing coefficients by the sample mean employment-to-population ratio. 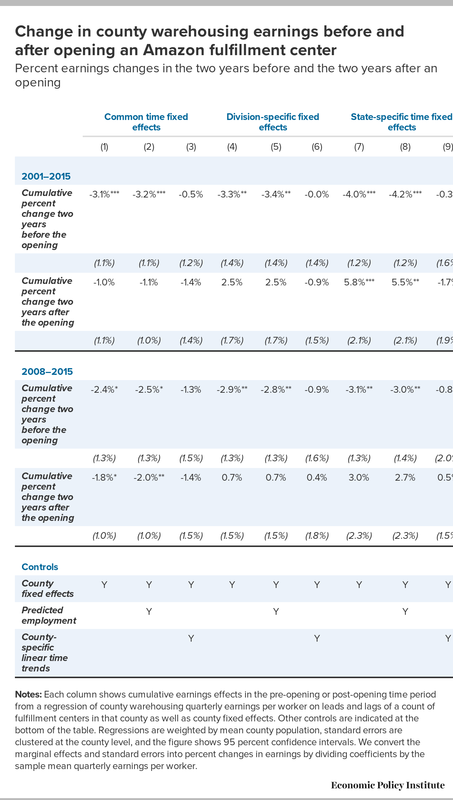 Notes: Cumulative employment effects are from a regression of county private-sector employment per capita on leads and lags of a count of fulfillment centers in that county as well as county fixed effects and county-specific linear time trends. The top, middle, and bottom panels, respectively, show specifications with common, Census division–specific, and state-specific time fixed effects. See the Appendix tables for results from other specifications. Regressions are weighted by mean county population, standard errors are clustered at the county level, and the figure shows 95 percent confidence intervals. We convert the marginal effects and standard errors into percent changes in employment by dividing coefficients by the sample mean employment-to-population ratio. Notes: Each column shows cumulative earnings effects in the pre-opening or post-opening time period from a regression of county warehousing quarterly earnings per worker on leads and lags of a count of fulfillment centers in that county as well as county fixed effects. Other controls are indicated at the bottom of the table. Regressions are weighted by mean county population, standard errors are clustered at the county level, and the figure shows 95 percent confidence intervals. We convert the marginal effects and standard errors into percent changes in earnings by dividing coefficients by the sample mean quarterly earnings per worker. Notes: Each column shows cumulative employment effects in the pre-opening or post-opening time period from a regression of county private-sector employment per capita on leads and lags of a count of fulfillment centers in that county as well as county fixed effects. Other controls are indicated at the bottom of the table. Regressions are weighted by mean county population, standard errors are clustered at the county level, and the figure shows 95 percent confidence intervals. We convert the marginal effects and standard errors into percent changes in employment by dividing coefficients by the sample mean employment-to-population ratio. Source: Avalara (“Amazon Fulfillment Center Locations,” accessed October 2017), Guided Imports (“The Complete List of Every Amazon Warehouse and Distribution Center in the World,” last updated April 2017) and MWPVL International (“Amazon Global Fulfillment Center Network,” accessed October 2017). 1. A December 2016 report from Good Jobs First counts “at least $241 million in subsidies to Amazon facilities” since the start of 2015 on top of “some $600 million in subsidies during the previous decade, a substantial portion of which was tied to deals involving sales tax collection.” And “there are likely more subsidies that can’t be quantified here due to lack of disclosure,” the report said. A March 2017 article in Bloomberg Daily Tax Report said that Amazon “is expected to vault past a record for state and local tax subsidies held for many years by Wal-Mart Stores Inc.” which has “captured more than $1.2 billion in tax abatements, credits, exemptions, infrastructure assistance and financing deals during four decades of rapid expansion.” See Thomas Cafcas and Greg LeRoy, Will Amazon Fool Us Twice? Why State and Local Governments Should Stop Subsidizing the Online Giant’s Growing Distribution Network, Good Jobs First, December 2016 and Michael J. Bologna, “Amazon Close to Breaking Wal-Mart Record for Subsidies,” Bloomberg Daily Tax Report, March 20, 2017. 2. Jessica Bruder, “With 6,000 New Warehouse Jobs, What Is Amazon Really Delivering?” Reuters, June 17, 2015; Chris Isidore, “Amazon Hiring 7,000 Workers” CNN Money, July 29, 2013; “We’re Hiring: Amazon Creating 120,000 Seasonal Jobs in Customer Fulfillment and Customer Service This Holiday Season,” Amazon Press Release, October 13, 2016; “Amazon Announces Ninth Fulfillment Center in Texas; New Robotics Site Will Create 1,000-Plus Full-Time Jobs,” Amazon Press Release, January 18, 2017. 3. See Brian Fung, “Amazon Releases List of Metro Areas Being Considered for Its Second HQ,” The Washington Post, January 18, 2018, which links to the District of Columbia bidding proposal. 4. Los Angeles Times Editorial Board, “Do Tax Incentives Really Create Jobs?” Los Angeles Times, September 10, 2014; Carl Davis, Tax Incentives: Costly for States, Drag on the Nation, Institute on Taxation and Economic Policy, 2013; David Seiden, “Do State Tax Incentives Really Work?” Huffpost, November 22, 2013. For the pro and con debate about Amazon specifically see Mark Vandevelde, “Amazon Is Creating More Jobs than It Destroys,” Financial Times, July 29, 2017, and Jon Swartz, “Amazon Is Creating 100,000 U.S. Jobs, But at What Cost?” USA TODAY, January 13, 2017. 5. Robert G. Lynch, Rethinking Growth Strategies: How State and Local Taxes and Services Affect Economic Development. Economic Policy Institute, 2004. 6. Davis, Tax Incentives, 2013. 7. Lynch, Rethinking Growth Strategies, 2004. 8. Lynch, 2004 and Timothy J. Bartik, The Economic Development Benefits of Universal Preschool Education Compared to Traditional Economic Development Programs, W.E. Upjohn Institute for Employment Research, 2006. 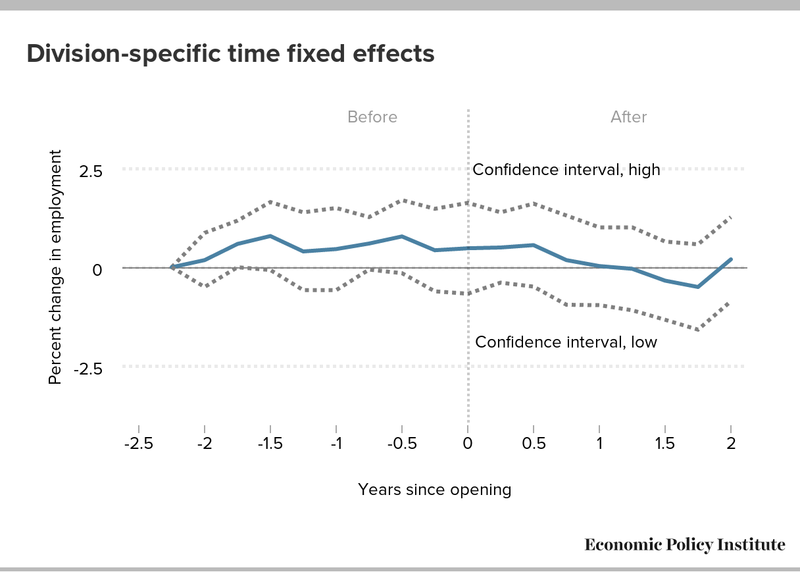 Recent research also finds state economic development incentives have little correlation with unemployment levels, income levels, or future economic growth. See Timothy J. Bartik, A New Panel Database on Business Incentives for Economic Development Offered by State and Local Governments in the United States, W.E. Upjohn Institute for Employment Research, 2017. 9. Our data on Amazon fulfillment centers comes from publically available sources described in the “Empirical methodology” section. 10. Estimates from MWPVL tabulations find that fulfillment centers account for 92.8 million out of 121.6 million square feet in Amazon’s distribution network. See “Amazon Global Fulfillment Center Network,” MWPVL, updated January 2018. 11. See “Amazon Fulfillment Center Locations,” Avalara TrustFile, accessed October 2017; “The Complete List of Every Amazon Warehouse and Distribution Center in the World,” [downloadable Excel files], Guided Imports, last updated April 2017; MWPVL International, http://www.mwpvl.com/html/amazon_com.html, accessed October 2017. 12. QCEW data are available at https://www.bls.gov/cew/datatoc.htm. 13. The public-use QCEW data suppresses some county-industry-level aggregations in order to protect employer identities. Our sample begins in 2001 because prior to that date it is not possible to distinguish between whether county-industry employment was truly zero or suppressed. Our sample ends in 2015 because our regressions specifications require two years of data after fulfillment center openings, and openings data were only available through 2017 when we conducted our analyses. We identify the warehousing industry as NAICS (North American Industry Classification System of the Census Bureau) 493. QCEW data are available at https://www.bls.gov/cew/datatoc.htm. 15. We regress the industry-level employment-per-capita on an indicator for presence of a fulfillment center in that quarter. In addition to the contemporaneous fulfillment center indicator, we include eight quarters of leads and eight quarters of lags of the indicator. 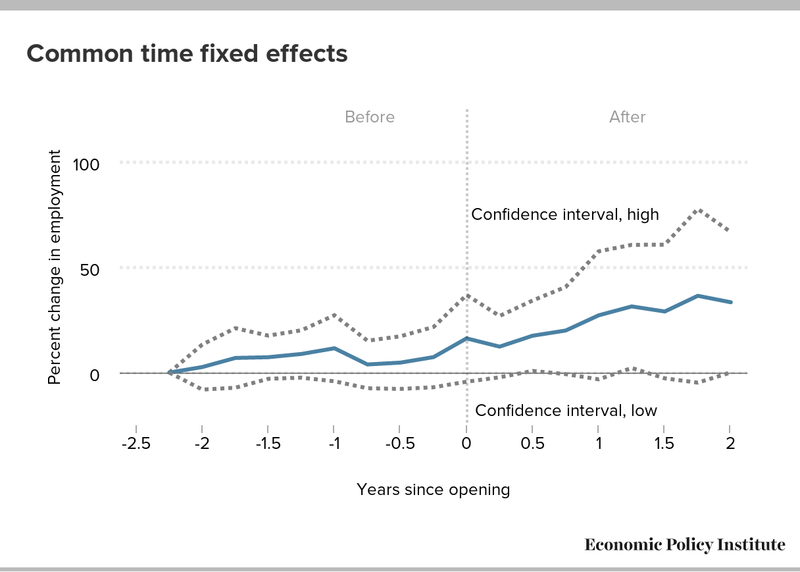 All regressions include county fixed effects. In the table and some of the figures described in the text, we include several additional controls, depending on the specification: common time fixed effects, Census division–specific time fixed effects, or state-specific time fixed effects; a predicted employment-to-population ratio; and county-specific linear trends. For specifications with a control for predicted employment-to-population, predicted employment is an industrial shift-share prediction from the sum of mean 1996–2000 county-level 3-digit NAICS shares of national employment multiplied by contemporaneous national industry-level employment. All regressions are weighted by the mean population in the county and standard errors are clustered at the county level. We convert the percentage-point employment-to-population ratio marginal effect and standard errors into a percent change in employment by dividing coefficients by the sample mean employment-to-population ratio. 16. For the three specifications shown in Appendix Figure A, the average cumulative effect over the two-year post-treatment period is 26.0, 28.4, and 40.0 percent (these values are the difference between the cumulative effect in the post-treatment period minus the pre-treatment period). A simple average of these estimates is a 31.5 percent increase in warehousing employment growth. The average warehousing employment in counties that open fulfillment centers, prior to the opening, is about 4,200 jobs. 17. See The Economist, “Unfulfillment Centres: What Amazon Does to Wages,” January 20, 2018. 18. Olivia LaVecchia and Stacy Mitchell, “Amazon’s Stranglehold: How the Company’s Tightening Grip Is Stifling Competition, Eroding Jobs, and Threatening Communities,” Institute for Local Self-Reliance, November 2016. 19. Greg LeRoy, “Memo to Politicians: Bargaining for an Amazon Warehouse? Turn the Tables!” Bloomberg BNA Daily Tax Report, July 25, 2017. 20. “‘Not Your Grandparents’ Deal’: Good Jobs First Issues Statement on Amazon HQ2 “Short List” Announcement,” press release, Good Jobs First, January 19, 2018. 21. “Amazon Global Fulfillment Network,” MWPVL, accessed February 28, 2018.